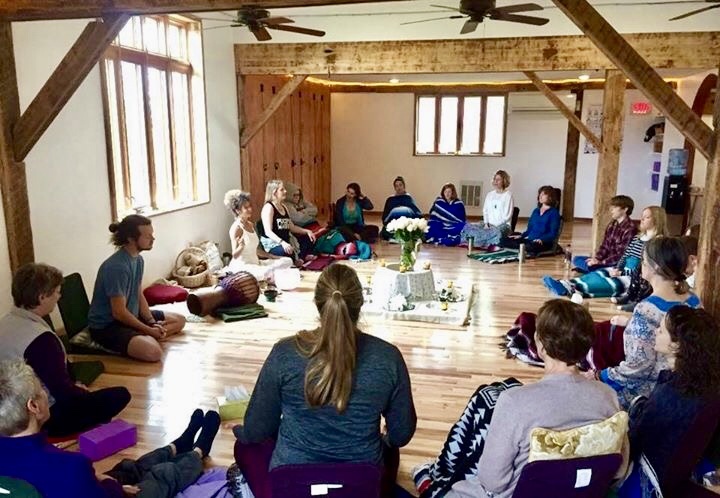 At Yoga Farm, we teach meditation for householders—people who live in the world, who have relationships, jobs, families, houses, to-do lists. Yet, if we are trying too hard to ‘control our thinking’, or sit up straight, or follow a breath or mantra without interruption, we may get frustrated and miss out on some of the inherent benefits of meditation. A meditation talk with Christopher & Jeannie of the School For Radiant Living at Yoga Farm. This is an evening conversation during our Yoga Teacher Training 200 hour. See www.YogaFarm.us for upcoming dates. Your life experiences, your body and mind, your relationships, your loves, your desires, are unique. A being like you has never before existed. There are literally thousands of different kinds of meditative techniques. With just the right meditation approach and instruction, your meditation will become effortless, easeful, and something you will truthfully look forward to. When you discover the specific meditation practice that you relish, meditation will then become a time to be with yourself, for healing, inspiration, integration, for rest. Meditations can involve breath, sound, movement, touch, smell, taste. Meditation can be accessed indoors our outdoors. Standing up, lying down, or sitting in any position. Meditations can be short or long. Meditation can feel wonderful, and it can feel turbulent at times – both are part of the process, and welcomed. At Yoga Farm, we offer weekly meditations as a group, and a custom-tailored private meditation course. It is our great passion and honor to Guide you in a style of meditation that is effective, efficient, and extremely dear to our hearts. We are honored to lead You in the style of meditation that our teacher, Lorin Roche, has taught Westerners for many years. “Meditation is a great gift to give yourself. It is a way to experience a higher quality of life just by going inside yourself and touching your center for a moment. It is a brief retreat from the world that lets you re-enter the world with a more vivid presence. Meditation is about being intimate with your deepest self. Any sense of formality, any sense that you were doing a technique that comes from outside of yourself interferes with this necessary closeness. Approaching meditation with a pleasurable indulgence will help you develop good instincts for your path, because instinctive guidance comes from the same place as your cravings and desires. When we get in touch with her instincts we can become our own guided meditation with your own daily life as your feedback mechanism. “Christopher specially tailored our meditation and mindfulness session according to goals that my husband and I had set but had not moved towards. We wanted to get back into consistent meditation, and Christopher suggested a 28 day meditation practice. That worked! We can see the improvement in our ability to meditate together."